I came across this quote in one of the food blogs and it inspired me to write this post. Ever since I started to consciously incorporate healthy eating as a habit, I have been focusing on eliminating various processed/packaged foods from my shopping trips and ensuring I address most of my cooking requirements from scratch. Over the years, this do-it-yourself (DIY) practice has become a habit now and it doesn't take too much of my time as I had initially thought. Little bit of planning is all that is needed. When I make pasta sauce from scratch, I can never get the dark red color even though I use ripe red tomatoes. I'm sure the packaged sauce has some form of artificial coloring added to it. I prepare the pasta sauce, just before making my pasta. 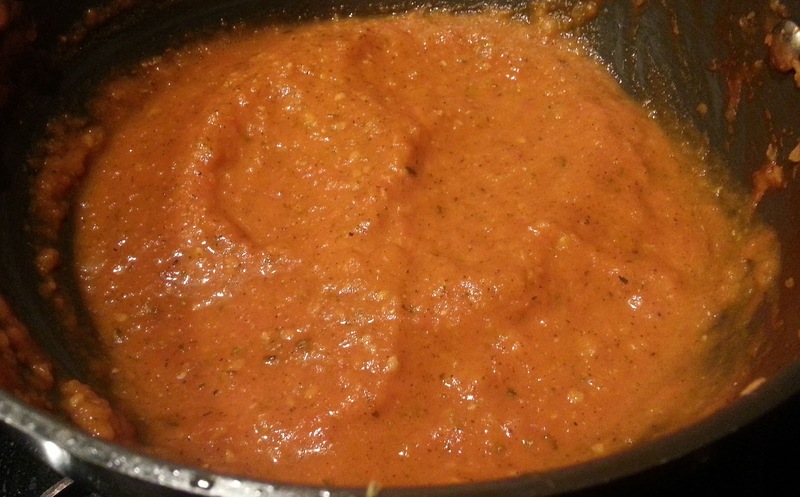 It hardly takes me 30 minutes to make fresh sauce and add freshly boiled pasta directly to the hot sauce. Tastes yummy, I can guarantee you. Our weekly grocery store visit used to end up with 4-5 Nestle dahi cups. I remember a 400 ml cup used to cost around Rs.16 in 2005. And the rates have now gone up to Rs.55 per cup. The thick and tasty curd kept us hooked onto it for many years and we didn't feel the pinch of rising costs. Since last year, we decided to cut down on luxury expenses. The monthly expense on curd was going up (Being a South Indian, our meals always end with curd rice!). I started to buy an extra pack of Nandini milk and prepare curd every night. The home-made curd doesn't come out as thick as the store-bought one, but tastes much better. All of us at home have now got used to home-made curd, which used to be the norm when I was a kid. Every South Indian household would stock up on Idli/dosa batter in the fridge. For some reason, I have never been able to like the taste of store-bought batters. Either the idlis turn out hard or dosas come out with a batter-y taste. I prepare the batter at home using my mixer 1-2 times a week. Remembering to soak the ingredients is the key challenge here. Once that is planned, grinding the batter hardly takes 10 minutes. Admiring the freshly fermented well-risen batter first thing in the morning is a sheer joy to me. Apart from the regular idli/dosa batter, I make a variety of millet-based batters that increases the nutritive quotient of my family's breakfast. I mix-and-match the cereals and pulses to break the monotony. The famous ID idli batter brand costs around 50 bucks a pack. I buy them rarely when I'm short on time or when there's nothing left in my fridge to prepare a quick dinner. I find the boat-shaped packaging (which was intended for direct use) extremely inconvenient to handle and most importantly, we are adding more plastic to the garbage. Once in 3-4 months, I dry roast the ingredients and grind the powders for sambhar/rasam at home. Since I make in small quantities, it stays fresh. I can adjust the spice/heat according to my family's tastes. Recently, I have also started preparing the idli chutney powder at home. Store-bought ones are very spicy for our palate. And I'm sure of the exact ingredients I use. Being hygiene-conscious, I'm very skeptical of store-bought sprouts and pre-cut fruits/veggies. Even for the high-effort, tear-inducing small onions and garlic, I prefer not to buy the peeled ones. Who knows whether the person who does the peeling has washed his hands properly or not? For sprouts, I use a sprouts maker, which is just a plastic pan. You can easily make sprouts by covering soaked lentils in a piece of wet cloth and placing it in a small casserole/hot pack. Making them at home also gives you the flexibility to mix-and-match, adjust the quantity and store properly. I don't pre-cut veggies before hand and freeze. The nutrients get lost, even though it makes life easier. I cut the required veggies just before cooking. It does take more time for me to cook a meal but I know that I'm eating fresh and getting most of the nutrients (Some are already lost in transportation and storage). There are still some more food items that I buy regularly from the store. Planning to DIY these items in my second phase of DIY project. Are you on the DIY path in your kitchen? I would love to hear your experiences.